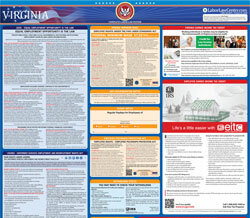 The Unemployment Compensation in the Commonwealth of Virginia (Spanish) is an unemployment law poster by the Virginia Employment Commission. This poster is mandatory for some employers, including all employers who employ spanish speaking employees. This poster, written in Spanish, must be posted in a conspicuous place by all employers so that all Spanish speaking employees can see it. This poster describes who can apply for unemployment benefits and where to file a claim. It appears you don't have a PDF plugin for this browser. Please see the link below to download virginia-vecb29sp.pdf. •  Present e un reclam o a la Comisión de Empleo de Virginia. por Desempleo de Virginia o cualquier otro E stado dentro de su Período Base. • Debe estar desempleado por causas que no son culpa suya . • Debe ser capaz y estar  disponible para trabajar y estar activamente buscando trabajo. • Contin uar reportándose según las instrucciones de la Comisión de Empleo de Virginia. nuestro Centro de Contacto al Cliente al 1 -866 -832 -2363. EN UN LUGAR VISIBLE  PARA TODOS LOS TRABAJAD ORES. Ayudas y servicios auxiliares están disponibles a pedido de las  personas con discapacidades.